Almost every place in the world has its own folklore figures that some get very famous and represent the culture of the place they come from. The figures sometimes could be an evolution or adapted version of older personas from a foreign place and this explains why some cultures have similar folklores that seem to be adjusted in a way or another. This is what happens to Russian “Santa Claus”, Ded Moroz. If in the western world Santa Claus is accompanied by Black Peter, then Ded Moroz has Snegurochka as his helper. Let us now find out — amazing facts about Ded Moroz and Snegurochka, two of the most popular characters in Russia’s folklore. The history of this Russian Santa Claus has its way back to the mythology of Slavic paganism thousands of years ago and used to be popular in Soviet Bloc countries like Belarusia, Slovekia, Bulgaria, Serbia, and more. This figure was once banned by the Soviet Union due to how the children in Russia started to consider him as a god and at that time there was no room for such thing so close to being a religion. When the Union collapsed in the 1990s, Ded Moroz was back into the scene although in modern days he is left behind by the countries that belong in the Soviet Bloc except for Russia. There, his popularity is still going strong until now. If the name is translated into English, Ded Moroz means Father (or Grandfather) Frost. He is 2000 years old and, unlike Santa Claus who lives in the North Pole, coming home to Veliky Ustyug, a town in Russia. He would start leaving his house to meet well-mannered children and give them presents in September. But the most important time of the year for him is on the New Year’s Eve. He would leave the gifts under the New Year Trees instead of on Christmas. Ded Moroz is pictured to be more manly and well-built than Santa Claus. His ankle-long robe could be red but most of the time is blue. He carries a magic-staff, something like a tall stick, and wears a pair of tall Valenki, the traditional Russian felted boots, to keep his feet warm. When travelling around, Ded Moroz gets on his troika that is pulled by three beautiful horses. You can experience the same ride when you visit Russia during the Winter Festival from mid-December to mid-January. The story of Father Frost has not always been magical or children-friendly. At the beginning of the creation of his character, Ded Moroz was actually a snow demon who would kidnap children and ask for gifts from their parents if they want the kids to be released. His magic staff was used to chain water and turn it into ice. But then, under the influence of Orthodox Church, his figure was turned into someone kinder with a good heart that children could admire and love. He doesn’t visit the children’s houses through the chimney but through the front door instead. That says a lot about how close his figure is to the Russian kids and parents. Different from other similar figures, Ded Moroz has a female companion named Snegurochka. She is the granddaughter who helps him around when the gift-giving season comes in Russia. The translation to the name is Snow Maiden and her history is not as long as her grandfather. Because she is the only female character ever made to accompany a figure like Father Frost, her appearance only started to happen in the 19th century. As a single character, Snegurochka has many exciting and beautiful adpatations and folk tale versions. The fact that she is a Snow Maiden also known as Snow Daughter or Snow Princess, a lot of stories could be made out of the idea. One says that she is made out of snow by a childless couple; another says her cold heart melts when she falls in love after her mother lends her feelings to warm her heart. These stories were written into stories and plays, and then some got performed in theatres too. When Russia still allowed Christmas celebration, Snegurochka was just a figurine that decorated the fir tree. And then all Christian traditions were banned so was her appearance. But, in 1935, the celebration of New Year was allowed and it was the year when her character came to life as Ded Moroz’s granddaughter and helper. She is pictured to be wearing a blue and silver robe with hood or a furry cap, sometimes a snowflake crown. Snegurochka is depicted as a forever young and beautiful woman with skin as white as snow, eyes as blue as the sky, lips as red as cherry, and long silver curly hair. Russian girls love to be dressed as her and play her character at school theatres or when the holiday season comes to Russia. 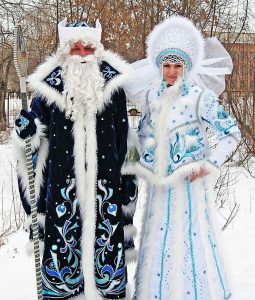 These two important figures in Russian culture; Ded Moroz and Snegurochka, are undoubtedly famous among the people of the country generally and children particularly. They always wait for the pair’s appearance towards the end of the year. During the Russian Winter Festival (December 25 to January 9) these two characters can easily be found in the parks giving away presents. You can also take pictures with them and find their figurines in the stalls of traditional markets sold as souvenirs. One that tourists would usually look for is the nesting dolls of the two; crafted into such beautiful art to be brought home. So, after you read about the 13 amazing facts about Ded Moroz and Snegurochka, would you like to meet them in person? Or perhaps you would choose to look forward to seeing the plays about the two get performed in theatres near you? Any of the options is surely something you should try to experience when you have the chance to, especially if you enjoy folk tales.